Poet Q.R. Hand Jr. author of “i speak to the poet in man,” “how sweet it is” and “whose really blues, new & selected poems,” spoke at the Rosenberg Library on Feb. 21 in an event held by the City College Creative Writing Program. Most notably his work was published in the 1968 “Black Fire: An Anthology of Afro-American Writing,” a collection of poems from the civil rights era edited by poet, scholar and civil rights activist, Amiri Baraka and Larry Neal. Both were key players in the Black Arts Movement (1965-1975) a period of artistic protest some compare to a more militant version of the Harlem Renaissance. Hand has performed at many venues all over San Francisco Bay Area, including the renowned poetry cafe Sacred Grounds and Bird & Beckett Books and Records, a local bookstore dedicated to jazz and literature named after late saxophonist Charlie “Bird” Parker and playwright Samuel Beckett. “Q.R. is a poet of all the neighborhood coffee houses,” said English Department Professor Loren Bell who hosted the event. Q.R. Hand is originally from New York and is a poet whose unique beat poetry style owes its roots to the oral tradition of Black culture. A child of the bebop era like other contemporary poets, Allen Ginsberg and Jack Kerouac, he absorbed the music’s chaotic and rhythmic sound. The way his poems are printed, zig-zagging in asymmetrical patterns on the page, punctuation and capitalization absent, suggest that they be left open to interpretation. 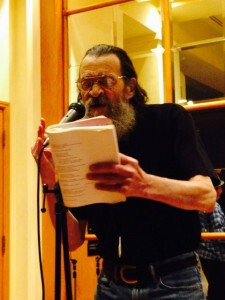 Hand however took his poetry a step further, regularly performing spoken word as part of the “Word Wind Orchestra,” an ensemble who seamlessly blend the melodic bend of spoken word with improvisational jazz. Even when there is no live music available his poetry lends itself to musicality. In keeping with that oral tradition although there were no live musicians at the Rosenberg Library, Hand’s sing-song delivery of his poems and wry wit kept his audience simultaneously spell-bound and poised on the edge of thought. “If you’ve been around in the neighborhood you might have heard something like this,” he said musing over the time he moved to San Francisco in 1969 while thumbing through the slim, white, cover of the book in his hand. “I am saying something,” it repeats over and over… “something else is being said, something else is being heard, something else is being experienced.” The words seem to echo with the fact that Hand at 80 years old has lived through many wars, including the Korean and Vietnam wars. Hand worked “many, many years in the Mission in the mental health system as a counselor”, his work with the homeless and his own personal brush with homelessness. During the Q&A portion of the event another contemporary of Kerouac, “Diamond” Dave Whitaker who is now a member of the Associated Student Council, strolled in and took a seat. “It’s so good to see you brother,” said Dave when Hand acknowledged his presence. Whitaker went on to thank Hand who helped him during his time in social work, when he was struggling with alcoholism. “We’re of the same generation, the Beat Generation, and we have so many memories. The spirit speaks to me like the spirit speaks to you and that’s what poetry is. I might be almost 80 years old but it’s not over yet,” Whitaker said. “As long as we’re kicking, something’s happening,” Hand said. The poetry of Q.R Hand’s mind survived the journey of revolution with a message that is still powerful and relevant as ever.